Campaign of the Carolinas, aka Carolinas Campaign, was the final campaign that consisted of a series of battles in the Western Theater* of the American Civil War. In January 1865, Union Maj. Gen. William Tecumseh Sherman advanced north from Savannah, Georgia, through the Carolinas, with the intention of linking up with Union forces in Virginia (see Sherman's March to the Sea and Campaign of the Carolinas History). 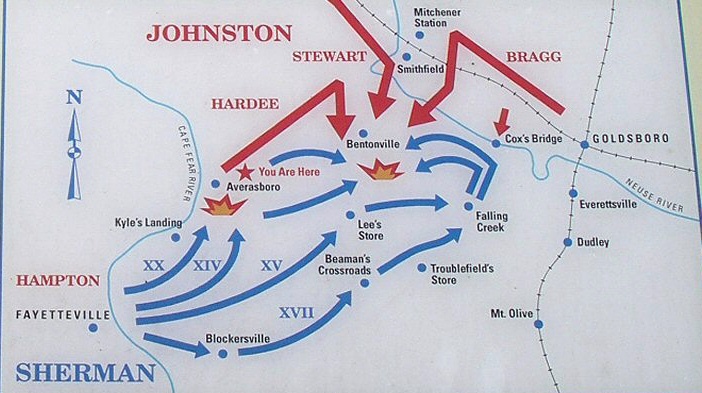 The defeat of Confederate Gen. Joseph E. Johnston's army at the Battle of Bentonville in March, and its surrender in April, represented the loss of the final major army of the Confederacy. 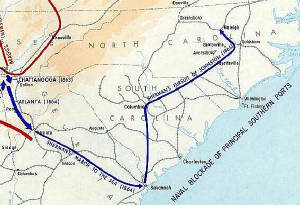 The Carolinas Campaign was also the final thrust in Sherman's March to the Sea. *Although the campaign took place entirely in states on the Eastern Seaboard of the United States, it is considered part of the Western Theater because it was a continuation of an offensive by the western armies under Sherman (the Military Division of the Mississippi), starting in Tennessee the previous year. "The Carolinas Campaign, aka Campaign of the Carolinas, consisted of the following battles: Battle of Rivers' Bridge , Battle of Wyse Fork (aka Second Kinston), Battle of Monroe's Crossroads (aka Fayetteville Road, Blue’s Farm), Battle of Averasborough (aka Averasboro, Taylor’s Hole Creek, Smithville, Smiths Ferry, Black River), and Battle of Bentonville." "I do think that in the several grand epochs of this war, my name will have a prominent part." He persuaded Grant that he should march north through the Carolinas instead, destroying everything of military value along the way, similar to his march to the sea through Georgia. Sherman was particularly interested in targeting South Carolina, the first state to secede from the Union, for the effect it would have on Southern morale. On April 18, three days after the death of President Abraham Lincoln, Johnston signed an armistice with Sherman at Bennett Place, a farmhouse near Durham Station. 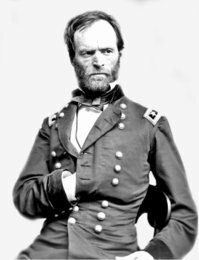 Sherman got himself into political hot water by offering terms of surrender to Johnston that encompassed political issues as well as military, without authorization from General Grant or the United States government. The confusion on this issue lasted until April 26, when Johnston agreed to purely military terms and formally surrendered his army and all Confederate forces in the Carolinas, Georgia, and Florida. It was the second significant surrender that month; on April 9, Robert E. Lee had surrendered the Army of Northern Virginia at Appomattox Court House. It was the virtual end for the Confederacy, although some smaller forces held out, or resisted, particularly in the Trans-Mississippi region, into the summer. See also South Carolina Civil War History. References: Eicher, David J., The Longest Night: A Military History of the Civil War, Simon & Schuster, 2001; North Carolina Office of Archives and History; Official Records of the Union and Confederate Armies.